"The public needs a strong, clear message from the animal protection community." "They've heard it. They've rejected it." – James McWilliams This was history professor James McWilliams's reply to Mary Finelli, founder of Fish Feel, in an exchange of comments relating to his blogsite post Beyond Veganism? published on August 18, 2015. The post was one of several that included A Modest Proposal – a challenge to animal rights vegan advocates to "consider trying to make an ethical argument for eating animals." The challenge includes a call upon ethical vegans to support eating insects – grasshoppers, ants, crickets, beetles, and others – as these animals appear unable to experience pain, based on a lack of identifiable pain receptors such as those found in birds, fish and mammals. Oysters and clams may be eaten for the same reason, McWilliams writes. Those of us who believe, with good reason, that oysters, clams, and insects are sentient, or who believe that, regardless, animal rights vegans should not be promoting animal consumption, are challenged to critique our "ideological purity" as a hindrance to helping animals, since the public doesn't support the animal rights vegan movement, according to McWilliams. He didn't just post these views on his own blogsite but took some of them to the opinion pages of The New York Times. In When Vegans Won't Compromise (Aug. 16, 2015), he and his coauthor scold animal rights vegans for reflexively choosing what they claim is our purity of principle over practical solutions for helping farmed animals. The charge is part of a challenge aimed at what McWilliams calls on his blogsite "the insidious anti-intellectualism at the core of the vegan movement." His specific target is the abolitionist stance of law professor Gary Francione, but ordinary readers of the opinion pages of The New York Times will see little of the spectrum of ideas in the animal rights vegan movement. For those who are hostile to animal rights, terms like "vegan fringe" and claims that the animal rights vegan movement is failing will be bracing. Here are some of my thoughts in response to such claims. 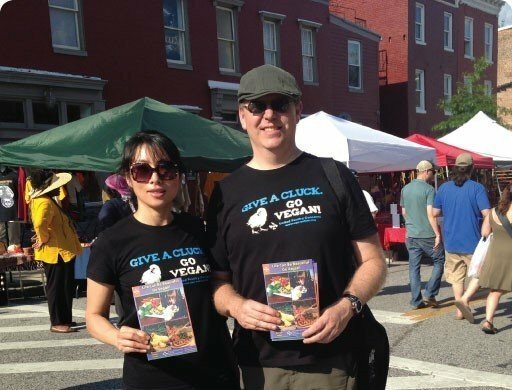 The animal rights message did not go public in the form of a burgeoning movement in the United States until the late 1970s – less than 50 years ago – and it wasn't until the 1980s that the vegan message became established among animal rights activists. In the year 2015, this message cannot be said to have been "rejected" by the mainstream, as the animal rights vegan movement is still very new. Fifteen years ago, it could reasonably have been thought that society had already "rejected" the gay rights message. Add to this the fact that the public is still largely ignorant of vegan foods and cuisine. While our message is about more than food, it may be said at this point that the public cannot be said to have rejected what it scarcely knows. Carol J. Adams, the author of The Sexual Politics of Meat and other books on the psychology of meat culture, has observed that when you are in power, you don't have to justify what you do with logic and evidence, but when you are not in power, you have to make your case with logic and evidence. Meateaters take what they do for granted – though on grounds much shakier than before the animal rights movement began – whereas ethical vegans and vegetarians feel a need to explain to themselves and others why they choose animal compassion over animal consumption. This is perfectly fine so long as the vegan attitude is not defensive but affirmative. Our intent should be self-awareness, education, persuasion, and change. As an animal rights vegan activist, I do not, however, feel obligated to construct an ethical argument for eating animals in order to stay mentally fit on the subject, any more than Martin Luther King should have felt obligated to construct an ethical argument for why white people are justified in discriminating against black people. In addition, I think it's insulting to animals for us to feel that we should engage in such a demeaning exercise, except as a parody. We all know and have internalized and rehearsed the justifications of the other side and done battle with them ad nauseam. Are feminists obliged to make an ethical argument for why women should be denied equal rights with men? It may be hard to remember now, but in the 1960s and '70s the mainstream media still scoffed at women's demands. Oysters, clams, and insects are members of the animal kingdom. As such, they deserve the benefit of the doubt. Their behavior indicates sentience and awareness even if the sources of their feelings are elusive to science, which apparently is not the case. Neuroscientist, Lori Marino, commenting on McWilliams's insect piece cited above, observes: "There are close to one million neurons in an ant or bee brain." All insects, she writes, "possess a complex central nervous system . . . and many insects show very complex learning capacities. . . . Just last year we found that fish and crustaceans feel pain when it was assumed that was just not possible for 'simple' organisms." There may be ways of experiencing being alive in the flesh and the world that we do not know and will never fathom. Nor is the experience of pain per se the only form of sentience or of suffering. Conscious perception of nonpainful but highly distressing stimuli include, for example, gagging, inability to breathe (dyspnea), smell of blood, apprehension, and fear. Throughout history, various groups of humans, birds and others have been written off as mindless and insentient until the truth showed otherwise. Muddying our message, and for what? If animal rights vegan activists take the position that oysters, clams, and insects may be farmed for human food (and "farmed" means factory-farmed), we are muddying our message, and for what? People don't need to eat insects to be well fed. The fact that people in some parts of the world eat insects and have probably done so forever is no reason for activists to support mass producing crickets for human consumption. In some places, people eat dogs and horses and monkeys, but we do not embrace every form of "cultural diversity." As soon as animal rights vegan activists start saying that oysters, clams, and insects may be ethically farmed and eaten, we create one more excuse for people to skip the vegan foods and head straight to the groups of animals that "even the vegans say are okay to eat." Instead of facilitating this behavior, we should be expanding the vegan economy, proudly promoting companies like Hampton Creek, Beyond Meat, Tofurky, Gardein, The Vegg, BOCA, and other innovators that are revolutionizing the culinary world and making the planet a better place. We owe our allegiance to these companies, not to clam diggers and ant farmers. I remember years ago, someone talking at an animal rights conference about how great it would be if only we could get food companies to put a "vegan" label on vegan products. It seemed wonderful back then, but unlikely to accomplish, yet thanks to animal rights vegan zeal, it has happened. This is one example of how pushing forward with new ethical desires and demands that may seem outlandish at first pays off. We owe it to the billions of animals who, as we sit comfortably at our computers and shop at stores overflowing with things to eat, are living in hell. We owe it to them to stake our claim and expand our territory and to advocate, not glumly or belligerently, but passionately and positively. Confidence in our cause and the courage to advance it will make the difference. It already has made a difference, and this is just the beginning, as long as we are strong. Mary Finelli of Fish Feel found this poem, read by Garrison Keillor, on The Writer's Almanac. Please click on the link above, hit Play, and listen.